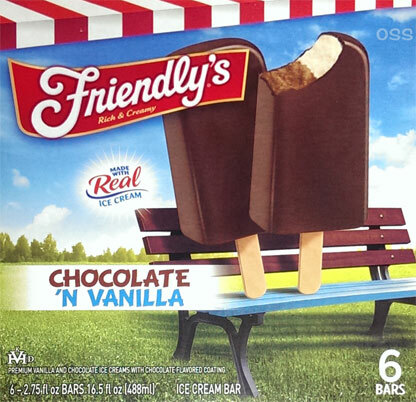 [2018 Update] Friendly's has retooled a couple of their bars, maybe it's a side effect from being purchased by Dean Foods. Basically their side by side bars are no more. 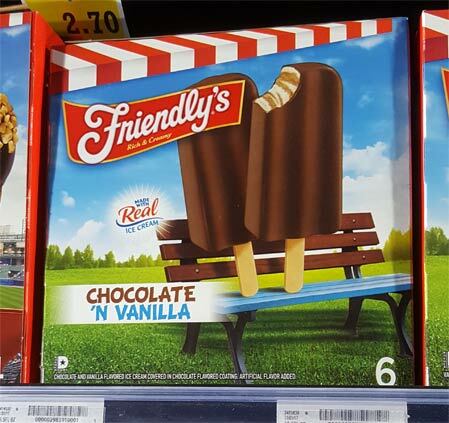 In the case of this bar, the two ice creams are now swirled together. I guess we won't being eating one flavor and then the other anymore. Original review is after the break. So the fun factor here is that they've managed to lay two flavors side by side in an ice cream bar. I can't think of anyone else that's done this. Does it work? Yeah, I would say it does. You can chow down on one side then the other, you can alternate, you can do whatever you want. The only thing strange for me (besides the overly thin shell that doesn't really melt on your tastesbuds), is the ice cream itself. 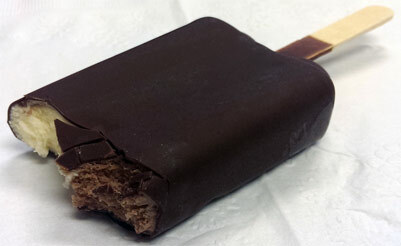 See, it tastes just like the ice cream you would find in a chocolate eclair bar, it even looks like this. So in my strange little world of too many memories, it's kind of weird to have the ice cream flavoring of one treat inside the shell of another treat. Nitpicking? Totally. Pleasseee review the Friendly's Reese's ice cream cake! I need to know if it is worth $20.. which seems crazy to me. Sorry, but I only really buy nut based ice creams at lunch, and $20 is way too much for a snack (and kind of hard to stash in the freezer at work). That said, I can't imagine that it's not really good. Anon, maybe I'll pick it up as an apartment warming gift when I move in the coming months. I tried the birthday cake and it's the bomb y'all!